In past years, Macworld Expo often proved to be a great venue where iOS game makers could grab some attention for their apps. The show may have a new name, but Macworld | iWorld remains an ideal launching ground for iOS games, particularly for smaller developers who don’t often get to bask in the limelight. This week’s show gave iOS game developers the chance to tout their latest mobile wares to the assembled crowds, handing out free promo codes and paraphernalia to gaming fans. After spending a couple days on the Macworld | iWorld show floor, a few titles stood out from the rest. Pokertini by Smappsoft: App developer Smappsoft specializes in poker apps for the iOS platform, having already won the accolades of professional poker players for offerings like Chinese 13 Card Poker. The developer’s latest effort is one video poker enthusiasts may appreciate. Like the video poker games you’d find at a casino, Pokertini deals you five cards, and you can opt to hold any number of them while redrawing. But instead of simply one hand, you get three—thus increasing your likelihood of a payout. You can also add “twists” that give you special powers—you can block a particular suit, block high or low cards, move cards to different hands, and so forth. All these “twists” cost in-game currency which you accumulate through winning. (There will also be an in-app purchase feature.) There are bonus rounds, a lively jazz soundtrack, and many social features to unlock like an experience and badge system. Look for Pokertini to hit the App Store some time in February. Hardwood Solitaire IV by Silver Creek Entertainment: Developer Silver Creek Entertainment has been in business since 1994, so it knows a thing or two about making great games. Naturally, its Hardwood Solitaire has become the Cadillac of solitaire applications on the iOS platform. The latest version, Hardwood Solitaire IV hit the App Store this month, and an update rolled out on Saturday added universal compatibility. You can move cards not just with a tap, but by employing gestures as well in this fantasy-themed version of solitaire. 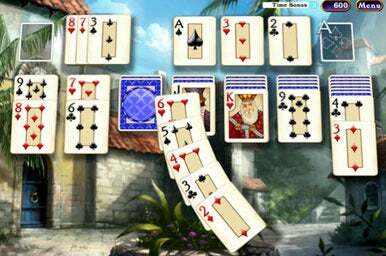 The game is constantly updating, and the developers are hoping to add more backgrounds, more themes, and more types of Solitaire to purchase. Garden Dash by PlayFirst: PlayFirst is one of the most successful and recognizable casual game developers out there, so any iOS offering comes with high expectations. Garden Dash, a new iteration of the successful Diner Dash formula, looks to continue the series’ winning time management formula. 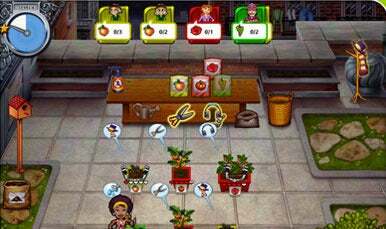 You play as Barb, a gardener who needs to cultivate and sell plants from her humble nursery. With cartoonish graphics and an intuitive tap-based control scheme, Garden Dash is a green thumbed-take on Diner Dash, only with plants. And judging by Diner Dash’s juggernaut-like status, that’s not necessarily a bad thing. The freemium app is currently available for the iPad. Liv Games made a splash last year at Macworld Expo with a preview of Legendary Wars. Combining strategy, role-playing, and action gameplay elements, Legendary Wars was a wholly original fantasy offering for the iOS platform. And soon, Legendary Wars will have a sequel. Monster Wars features twice as many characters, new modes, better controls and a much, much larger world. And this time, the story is told from the perspective of the monsters doing battle with the heroes from the last game. Each mission tasks you with gathering sources, building an army, and then leading that army against enemy forces and structures. Liv Games plans to make Monster Wars a universal release from the start. (Legendary Wars come in separate iPhone and iPad versions.) The app is slated to debut in the $1-$2 range. Liv Games told us that Monster Wars was submitted to the App Store for approval on Thursday, so look for it to arrive in the App Store soon. Dragon Island and Adventure Bar Story from Zigza Game: Just around the corner from Liv Games in the Mobile Apps Showcase, Zigza Game was showing off a pair of its own upcoming fantasy releases. Dragon Island showcases many of the common elements of fantasy RPG games, as you build an army of monsters to go on quests in an expansive world. Adventure Bar Story is an RPG app that places you in charge of a medieval tavern—instead of collecting gems and battling monsters, you’re gathering ingredients and battling animals for food. You then combine the ingredients into a dish that you can sell for money or consume to gain experience points. Dragon Island is about a month away from launch; it’ll cost between $1 and $3. Adventure Bar Story is looking at a launch at the end of February; it’s a $1 iPhone game. Totally Amp’d by XMG Studio: Ever wanted to be a pop super star? XMG Studio’s Totally Amp’d is for the teenage pop sensation in all of us (though the universal game seems more geared toward teens and ’tweens). Billed as an “interactive sitcom,” players can purchase and download “seasons” of ten “appisodes” depicting several fictional aspiring super stars and their attempts at music fame. The gameplay comes in when you can customize your character’s clothing and album covers as part of the “design studio,” sing karaoke and record your own songs as part of the “music studio,” and edit and sequence music videos as part of the “movie studio.” The initial app launched on this pas week for free; additional seasons of ten “appisodes” will cost $5 each. XMG Studio also previewed three other exciting apps that speak to the company’s range as developers. Ghostbusters AR will be a location-based and augmented reality game based on the 1980s movie. Your phone will notify you when there’s a ghost around; then, through augmented reality you’ll be able to “see” the ghost as you attempt to catch it. There are different levels to unlock and different ghosts to catch. Still early in its development cycle, the game is tentatively slated for a June release. Meanwhile, Drag Racer World caters to an entirely different set of gamers—the tribe of fans who really like tuning and customizing cars. The game will feature 50 different car designs and the ability to purchase, paint, tune and further customize your racer. Then there’s an online and offline racing one button racing component. Online, you can race against your friends and engage your nitro boosters to finally leave them in your dust. The follow-up to Drag Racer: Pro Tuner should arrive later this year. If fashion’s more your thing than cars, Fashion Star Boutique is also in development for a mid-2012 release. The app will features fashion design challenges that escalate as you progress through the game. Bag It by Hidden Variable Studios: A late 2011 release, Bag It is a casual puzzle game that tasks you with rearranging groceries without breaking anything. It’s a clever twist on the job that every grocery bagger in the world has to confront: How do you pack the milk so it doesn’t crush the eggs while maximizing space? Utilizing touch, gesture, and accelerometer controls, Hidden Variable Studios’ game features 50 levels and three main gameplay modes—standard, puzzle, and rampage (where the goal is to destroy as many items as possible). With an adorable cartoon art style and a forgiving learning curve that is sure to appeal to fans of all ages, Bag It is easily one of the most compelling apps shown on the Macworld/iWorld show floor this year. The game is currently available for $1 on the iPhone and $2 on the iPad. Mad Chef by Foursaken Media: There are plenty of cooking simulator apps on the iTunes store, but none of them let you throw screwdrivers at rats. Mad Chef is a recently-updated casual RPG/action game that is wholly original and utterly bizarre. 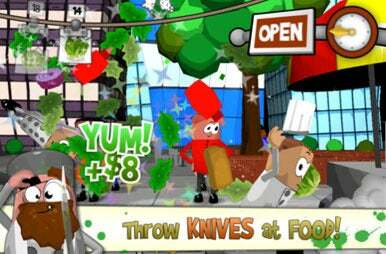 The chef starts by throwing ingredients across the screen—you must throw knives (or other sharp objects) at ingredients to fill orders. It makes the usual “grab ingredients to satisfy customers” formula a bit more lively. As customers increase, the flying ingredients and strange recipes make for a manic good time. The more money you earn, the more you can improve your restaurant empire. And the crazier you are, the more money you earn. Foursaken Media has promised a zombie mode coming out soon, but for the now the app can be downloaded on either iPhone or iPad for $1. Snow Gnomes’ best feature, however, may be its ability to record every one of your races. So when you race against an opponent, that “ghost” player is actually someone who has similar stats to you on the leader board. Defeat it, and you move up the rankings. It’s a clever twist on the “head-to-head” and “ladder” features of many racing apps. Macworld's Philip Michaels contributed to this report.